Immunoprecipitation of HeLa cell lysates using Mouse IgG (Sepharose® Bead Conjugate) #3420 (lane 1) and EGF Receptor (EGFR1) Mouse mAb (IP Specific) (Sepharose® Bead Conjugate) (lane 2). The western blot was probed using EGF Receptor (D38B1) XP® Rabbit mAb #4267. 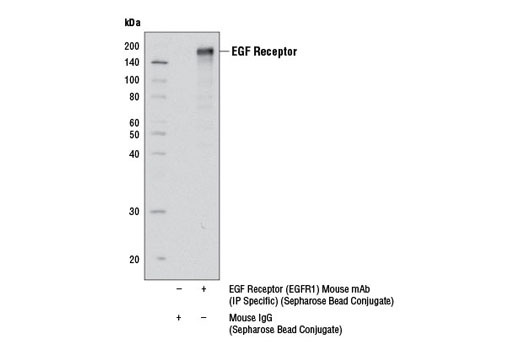 EGF Receptor (EGFR1) Mouse mAb (IP Specific) (Sepharose® Bead Conjugate) specifically immunoprecipitates endogenous EGFR1 protein from various cell lysates. This antibody does not cross-react with other EGF receptor family members. Monoclonal antibody is produced by immunizing animals with a recombinant protein corresponding to the extracellular domain of human EGFR1 protein. This Cell Signaling Technology antibody is immobilized via covalent binding of primary amino groups to N-hydroxysuccinimide (NHS)-activated Sepharose® beads. EGF Receptor (EGFR1) Mouse mAb (IP Specific) (Sepharose® Bead Conjugate) is useful for immunoprecipitation assays. The antibody is expected to exhibit the same species cross-reactivity as the unconjugated EGF Receptor (EGFR1) Mouse mAb (IP Specific) #2256.